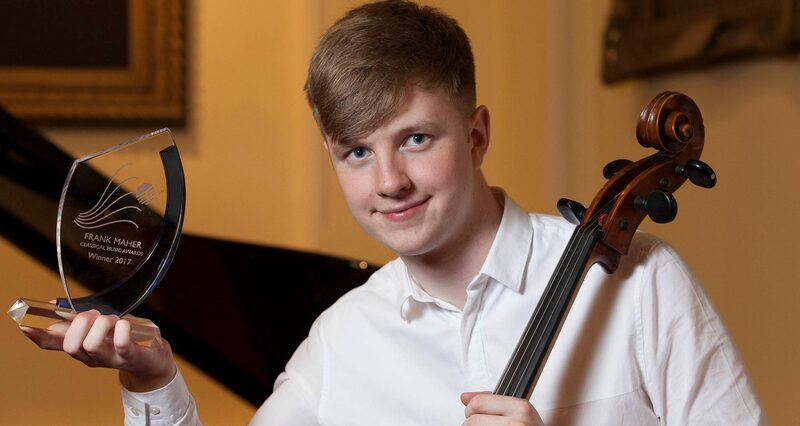 Killian White, a sixth-year student at Wesley College, Ballinteer, Dublin, is the winner of the 2017 Frank Maher Classical Music Awards sponsored by Top Security. It is Ireland’s largest classical music competition for secondary schools. Seven finalists from Dublin and Cork schools competed at the Royal College of Physicians in Dublin on Friday 10th November 2017 to win the top prize of €5,000 to develop their musical career. 17-year old Killian, who plays the cello, performed two pieces; Apres un Reve Op.7, No.1 by Gabriel Faure and ‘Moses’ Variations on One String by Niccolo Paganini. Aidan Chan, the 2017 winner who is now studying at the Royal College of Music in London, performed two pieces by Chopin for the audience. They were Etude Op.10 No.3 “Tristesse” and Ballade No.3, Op 47.